North Dakota weed growing may not be at the top of your to-do list, but if you are in North Dakota and are looking to grow your own marijuana, you might be curious how to do it. The first thing to keep in mind is that they are pretty harsh when it comes to marijuana. It arrests those with even ½ oz of marijuana in their possession, and it only increases the amount of weed you have. 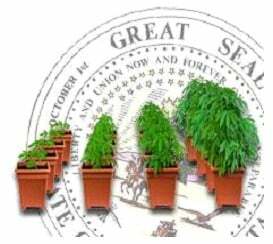 There aren’t any laws concerning cultivation, but they consider it the same as possession. If you think about it, it’s kind of hard to grow a plant that’s less than ½ an ounce. There isn’t a lot going on in North Dakota. The state has few cities and a flat endless terrain of fields. Lately, North Dakota has seen a growing oil industry, one which the state cannot even supply enough workers for. For that reason, there have been a large amount of out-of-state temporary workers, who are making money in this otherwise quiet state. These workers may not be aware of North Dakota weed laws, especially if they come from more liberal Minnesota, Montana or Nebraska. North Dakota weed growing does not seem to be a high priority issue for this state, based on their straightforward, unfazed-by-recent-drug-law-changes, policies. 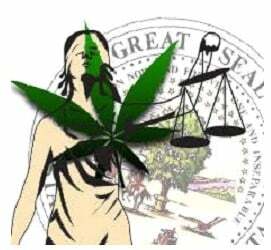 North Dakota has not instituted many of the policies other pro-prohibition states have, such as tax stamps, mandatory minimums or civil forfeiture. Instead, they keep it simple- have weed, go to jail. It makes you wonder how much they care. North Dakota recently put a medical marijuana program into place, allowing those with physician’s recommendations to possess, obtain, and smoke marijuana. For a short time, this meant some home cultivation was allowed for patients living 40 miles away from a dispensary, but unfortunately that no longer applies. North Dakota now has a medical marijuana program, but it was only possible for medical marijuana patients to grow legally for a very short while. In January 2017 the law was once again changed with the passing of Senate Bill 2344, which sets up a dispensary program in the state. Until the laws change again, it is important to keep your grow operation as hidden as possible. The best way to approach North Dakota weed growing is the expectation that you will need to stay discrete. Even though they have a conditional release program that gives first-time offenders somewhat of a pass, no need pushing your luck. In North Dakota, it is important to focus on not getting caught. The best way to do that is to spend some time creating an indoor or outdoor garden that is virtually undetectable. Download and read the Marijuana Grow Bible. This book is more than a simple ‘how to grow marijuana’ guide. It provides detailed information on setting up an indoor or outdoor garden that is well hidden from cops. Purchase high-quality seeds. Whether you decide to grow indoors or outdoors purchase the best seeds for your garden at I Love Growing Marijuana. Because our marijuana seeds are high quality, you only need to purchase a few to get the high yielding results you are looking for. Start Growing. With the knowledge of the Marijuana Grow Bible and your high-quality seeds, you are ready to get growing. Care for your marijuana plants with the tips in the Grow Bible, and you’ll find that your plants will take care of you. North Dakota weed growing may not be the most popular thing to do in this northern US state, but it is by no means impossible. With the knowledge in the Marijuana Grow Bible, you can learn how to grow an undetectable garden that no one in North Dakota will care about, unless, of course, there is oil under it. CAN I GROW MEDICAL MJ IN NORTH DAKOTA AND HOW CAN FARMERS IN NORTH DAKOTA GROW LEGALLY FOR DISPENSARIES? Help me get started please . My family owns land 120+acres in north Dakota which in the past has been used solely for growing wheat, soy beans etc. What kind of a license do we need to grow medical Marijuana? And what are the costs? Hi Mark, it's probably best to check with your county how to get the necessary papers in order. We're too far off to ensure correct infomation. Let us know if your plans take off! I want to start a Pharmacy for Medical Marijuana in Minot, ND and would like to receive more info on this and possibly connecting with someone like Jeffery to have ND product used for pharmacy. Please advise ?? Hi Judie, you can find more info on how to set up a dispensary here. I see right through this. When he fails with another team, it’ll just make Harbaugh look like a better coach. Nice play, Jim.